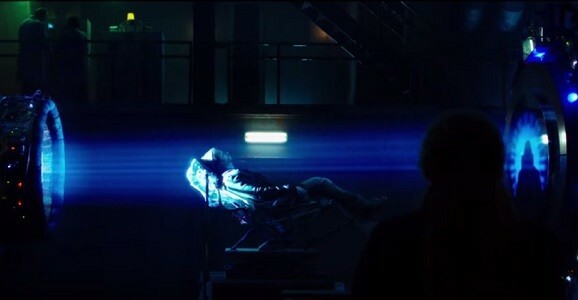 The small screen 12 Monkeys follows a character named James Cole, just like the film, but Aaron Stanford’s version isn’t a bald, drooling, spider-eating mystery prisoner. This Cole teems with guilt for having killed people in order to make it through the extremely deadly apocalypse. But his purpose is the same: to go back in time and stop the plague from happening. The setting is mostly the same, in as much as it takes place in a big city, though it isn’t clear who is keeping Cole. The imperfect time travel aspects are also similar, in that glitches and flubs are bound to happen. But we actually get to know a little more about this future than we did in the film, and that’ll include different characters who have other ideas and motivations when it comes to Cole’s time-traveling adventures. Everyone’s a potential threat. And don’t go thinking that the series will be handling the titular !2 Monkeys group in the same way, since that would be dumb. Here, the group’s purpose and significance in the overall scheme of things will be brought to light. What, no David Morse as a redhead? Lame. And then there are the supporting players Railly and Goines. No longer the psychiatrist with Stockholm Syndrome, Cassandra Railly (changed from Kathryn) is now a virologist and is more active in Cole’s quest. Goines, who was a male played by Brad Pitt in the film, is now a female math genius. I wonder if she’ll chew her middle fingernail a lot? Take a peek at the relationship between Railly and Cole in the video below. Nothing is said about the villainous character played by Zeljko Ivanek, seen in the trailers, or Tom Noonan’s mysterious Slender Man, but that’s probably because there wasn’t anything in the movie to compare them to. Do you guys like these changes enough so that the series feels justified? Or does it all just seem like a story that could have been told in a different way? Find out how the mysteries stack up when 12 Monkeys debuts on Syfy on Friday, January 16.